Thats right! I had completely forgotten about those types of containment. I was on scene when the FBI arrested one of "The Portland Seven" terrorists. I actually knew one of them from work, (I just gave away where I used to work), blended right in with all of us and he along with the others were convicted, sentenced, and confined to a CMU as an American enemy combatant. That was back in '03 and he's since been released. Yep, I hope 'Warrior' is knock'in them down and putting them away. Are these in the US proper? On bases or in some special designated area? Typically on campus grounds of US Federal prisons. I know Illinois, Indiana, W. Virginia, Colorado, Oregon, Nevada had them but that was over 10 years ago. Assume still present and probably have more locations. I just don't know what to make of all this.Is it possible these people are spies and the msm is playing narrative around it all? 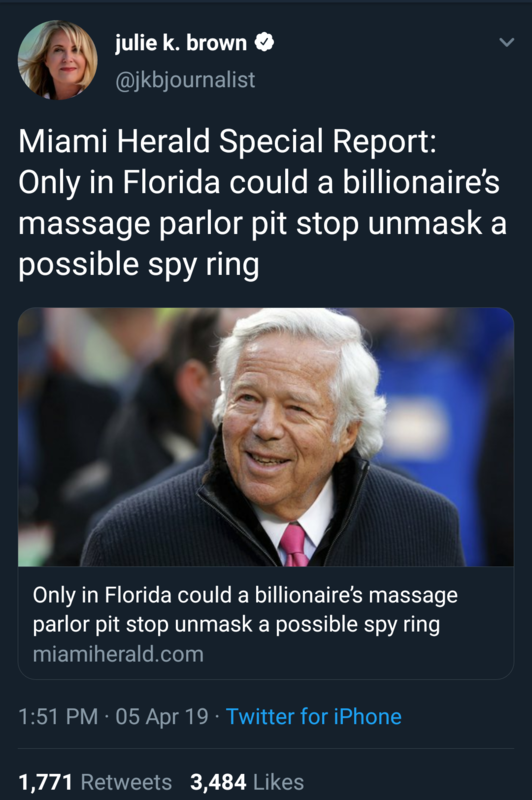 The idea that this is about a Chinese spy ring disguised as a rub-and-tug disguised as a day spa ... It’s just peak. We’ve reached peak Florida,” said Miami filmmaker Billy Corben, who’s built a cult following shooting popular documentaries about the state’s craziest stories. I think it's past my bedtime. Great stuff TOL..I usually just read and don't reply, I assume you know your value!! Same to WC..taught me so much I forgot. Yep! Assange and Rush Limbaugh were saying that even before Trump was sworn in. Limbaugh is still saying that's Democrat's ultimate goal...to make voters so sick of hearing about Trump being investigated, and any lies they can gin up, that they choose someone else in 2020. Forgot about the video that went with this early 90's protest song about kids dying by IRA bombers but the 'covered in gold' is a mystery. Assume religious connotations inherent to Irish culture. Dolores O'Riordan ('Cranberries' lead singer covered in gold) along with the kids; died (Drowning due to alcohol intoxication) on Jan 15 2018 at a London hotel, in a bathtub. As of March 2019, the video has over 880 million views on YouTube.